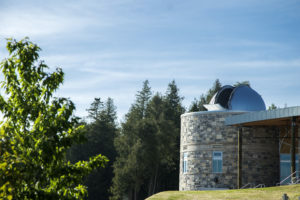 The new facility at the Headlands International Dark Sky Park in Mackinaw City opened June 2017. The facility includes rentable interior and patio space for private events and programs. A fully licensed kitchen and ADA restrooms are available, along with a stunning indoor/outdoor fireplace and a captivating open beam ceiling. An outdoor seating area is located on the Lake Michigan side of the building, and remains open to the public at all times. The green roof is planted with beautiful flora, to add to the natural ambiance and environmental sensitivity of the setting. Building capacity is 278 people. Capacity for comfortable tables-and-chairs seating is 120 inside and 80 on the covered patio. 5 foot round and 8 foot rectangular tables and chairs are available. Square footage: Assembly area, 2,482; kitchen, 470; lobby, 908. 67 parking spots are available. 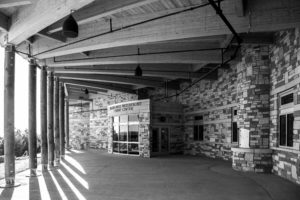 On non-program nights, the facility is open during gift shop hours; however, the 24-hour ADA restrooms located on the shoreline side of the building will remain open all day and night, year-round. The building is available for rental from 9 a.m. until 10 p.m. daily, year round. Rates includes the use of indoor space, outdoor patio space only, restrooms and kitchen. All events must end promptly at 10 p.m.
Renter is responsible for set up and tear down of chairs, tables, and equipment. Reservations can be made 18 months in advance. 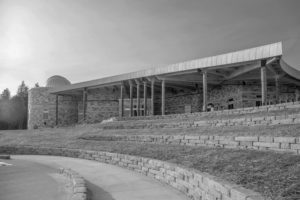 It is important to note that the Waterfront Event Center and Observatory is located within a public county park, which means the public will have access to the grounds during your event. 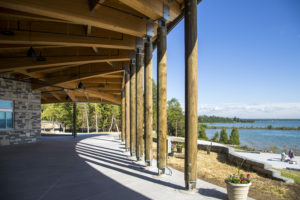 When you reserve the building for an event, you are reserving the interior space of the facility and the covered patio, not the amphitheater-style seating area or the surrounding grounds, shoreline, forested acreage, observatory dome or 24-hour ADA restrooms. The Guest House at the Headlands is also available for rent! The Guest House is a large home on the property that accommodates up to 20 guests overnight. It is rented to one renter at a time regardless of group size. It is located on the Lake Michigan shoreline about a half-mile from the Waterfront Event Center.